This restored five storey drainage windpump is the only National Trust property in the Norfolk Broads. 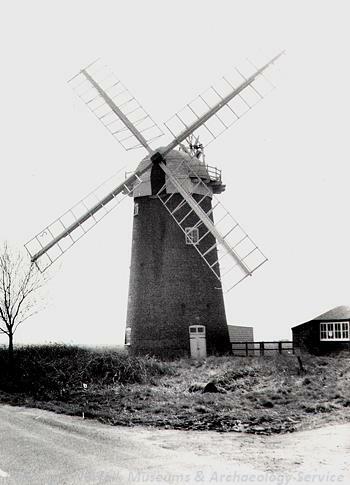 This fully restored historic drainage windpump has amazing views of the Broads and coast. The countryside around the pump is an internationally important wildlife site and a premier Norfolk birdwatching area. 15 miles north of Great Yarmouth on B1159; 4 miles northeast of Martham. Pay and display on site parking 50 yards from the property. National Trust members can obtain a free car park pass from the National Trust shop during opening hours. Small shop. Refreshments. Dogs allowed on leads and under close control in some areas. Parking: separate disabled parking, 50 yards from property. Building has a ramped entrance and the ground floor is accessible. Stairs to other floors. A photograph album of displays is available. Adapted toilet beside car park. Grounds are partly accessible. 400 yards of accessible path leading to viewpoint overlooking Horsey Mere. Seats at regular intervals. Level entrance to shop. Refreshments have a level entrance but there is a narrow doorway and limited space inside.